Every community has weaknesses and strengths and it is our Kenmore versions of these that inspire our selection of the work the KVIS chooses to do each year. Our process for selecting the events, initiatives, and campaigns that are ultimately placed on our annual calendar happens in several ways. 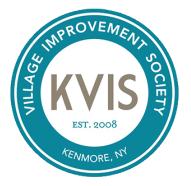 Very often a member will bring a Village problem or idea to a KVIS meeting. Members will discuss the idea and help define and identify it; this brings large and small points to light, clarifying the conversation. After this there may be more discussion leading ultimately to a plan of action that is effective because it comes from residents, from many different points of view, and is given time and thought to develop. This process usually happens at Committee meetings because the Committees have smaller groups of people compared to the general Society meetings. There are many reasons to join in helping to create a great Kenmore through this KVIS process. Perhaps you have an idea about something that you suspect would be beneficial to Kenmore, or maybe you have a complaint or an issue with a certain situation, or it could be that you just pine for stimulating and relevant conversation. At this very moment you may be thinking beyond these words to an idea of your own. Please don’t let it just sit in your head and do nothing, bring it out, get other KVIS members talking about it, and be prepared to enjoy the experience. It really is neat to speak with your Village neighbors this way and have the ability to do more than just talk about it. After all, the events, initiatives, and campaigns listed here were once just thoughts in a KVIS member’s head. Even as we are doing the events listed on the calendar above, KVIS Committees are also working on projects that are ongoing. Some of these projects and initiatives we have already been working on for several years, some are new this year. If you would like information about any of these or would like to help bring them to fruition, please contact the KVIS. There are some KVIS events, campaigns that have been very important to our community but are not listed on this website. For example, the Keep Kenmore Campaign was an initiative against dissolution of the Village; hundreds of hours of volunteer work was dedicated to this campaign alone.